When lululemon’s PR agency approached me to contribute some photos for their #choosehongkong campaign, I thought of Sean right away as my model. 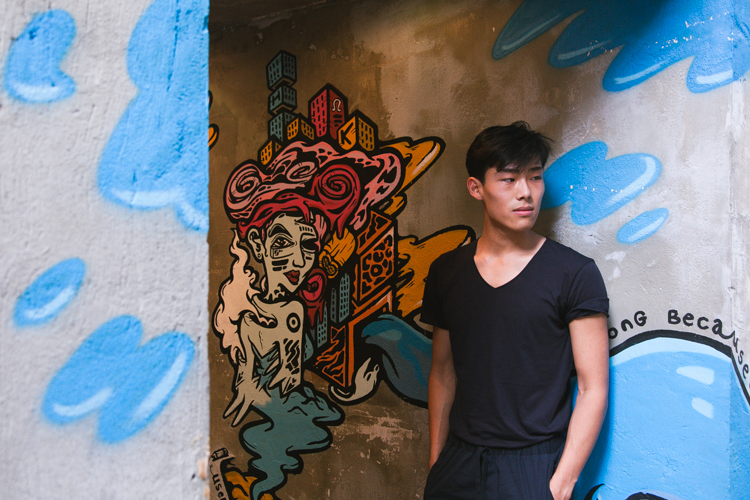 Knowing that lululemon is a fitness and wellness brand, I wanted to do something playful in front of their #choosehongkong murals, hence the idea of showing off Sean’s flexibility as a dancer and his handsome good looks! The two locations on Hong Kong Island for this dancer portrait photoshoot were at small restaurants Mana! Fast Slow Food and Little Burro in Central. Two amazing artists, Used Pencil and Bao, had painted their work outside these eateries, and incorporated the slogan “Choose Hong Kong” and lululemon’s logo into their wall art. It’s all about the brand’s belief in choice – and to celebrate them choosing this vibrant, awesome city as a new store location. Thank you Sean for working with me again! The sweltering summer heat in Hong Kong did not help us, but he really posed with grace in front of the camera!